Now they’re back with more. 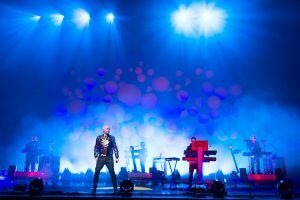 In London briefly, before the suitcases are repacked, Neil Tennant and PSB co-conspirator Chris Lowe are bringing their new show, ‘Electric’, to The O2 as part of a world tour that began in Chile in May. Tennant and Lowe are on good form. They are about to release their first studio album (also called ‘Electric’) on their own label, having left Parlophone in 2012 after 28 happy years. ‘Time for a change,’ Lowe says with understatement, but without bitterness. Relaxed, they make each other laugh. According to Tennant, the new show is ‘very energetic: more powerful than the last one. It’s still got a whole slew of hits in it but it’s darker.’ There’s an excerpt from ‘The Rite of Spring’ by Stravinsky and some barking dogs, but ultimately, says the singing half of the band, it’s a dance show. In the same week they are introducing a special screening of ‘Battleship Potemkin’ as part of their friend Yoko Ono’s Meltdown festival. Then next month, ‘Electric’ is released. The album is a chunky helping of upbeat, archetypal Pet Shop Boys dance music, and confirmation, following Nile Rodgers teaming up with Daft Punk, that this really is the new summer of disco. The album is produced by dance-pop guru Stuart Price; it features London rapper Example; and, true to Tennant’s dry eloquence, it rhymes (on the rousing ‘Love Is a Bourgeois Construct’) ‘Goldhawk Road’ with ‘penal code’. In the last ten months they have finished two albums (before ‘Electric’ came last September’s ‘Elysium’), worked on a forthcoming musical project about World War II codebreaker Alan Turing, and taken part in two of the key London 2012 events. After appearing on chariots playing ‘West End Girls’ at the Olympic Closing Ceremony they were also persuaded to play the Team GB parade in September after personal approaches by both Boris Johnson and David Cameron. More than 30 years on from the day the pair first met, in an electronics shop on the King’s Road, they show no signs of winding down. Chris Lowe is usually perceived as the ‘silent’ partner, standing behind his bank of keyboards. But off stage he laughs and chats as much as Tennant. He believes that buying a place in Berlin where they could write new songs has had a big influence on their creativity: ‘It’s a great place to work – so few distractions, life’s easy. Also you get a real energy from the place. It reminds me of New York in the ’80s, it has that excitement on the street: artists have moved there, it still feels very underground, like New York was back then. ‘There we were in Berlin watching Vampire Weekend,’ adds Tennant. ‘And there we were after the show, backstage at Vampire Weekend’s gig: how did that happen?’ He leans forward and laughs at the thought, mildly self-mocking. Over the years, they have collaborated with artists Sam Taylor-Wood and Wolfgang Tillmans, and with choreographer Javier De Frutos at Sadler’s Wells. In 2011 they toured as Take That’s support act, and they have worked with Lady Gaga, Scissor Sisters and The Killers. But Tennant politely sidesteps the suggestion that musicians like The Killers’ Brandon Flowers approach them as some kind of Oracle of Pop. ‘What I quite like is that people often do what they think sounds like us,’ he says, ‘and we normally don’t think it sounds like us. I think we’re just quite flattered and surprised by it. Through our entire career we’ve tried to present things in a way that sometimes means people don’t know how to take us. For example, we don’t like to do “serious” by being serious. And you sort of worry about how people interpret what you do, but a generation has come along who have just accepted and enjoyed it. So how did they come to cover a Bruce Springsteen song on this album? Springsteen is also back in London this summer, but in the last decade even The Boss would struggle to claim Pet Shop Boys’ live chops, while other renowned kings of the festival circuit have paid their respects. ‘Which one is the tall one from The Chemical Brothers? Is it Tom?’ asks Tennant.